Here's a simple yet effective pass-around Braille item! This hard-plastic tray measures just 6.5" by 7.5"; and is over a quarter of an inch thick. 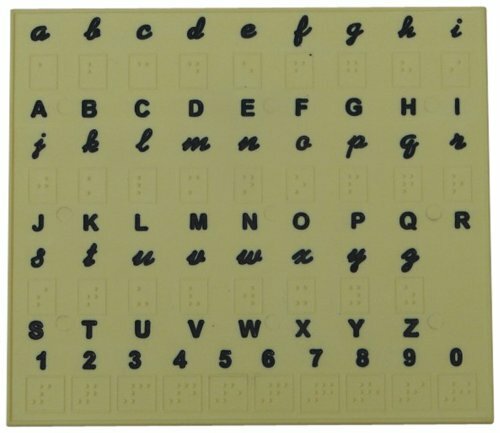 On it are embossed all 26 letters of the Braille alphabet - with their equivalent print capital letters engraved beneath and small letters above. The bottom line also features the numbers 0 through 9. Because our durable alphabet tray is many times more sturdy than any alphabet sheets or cards; it lends itself beautifully to classroom settings - where it'll surely stand up indefinitely. And because the Braille characters are embossed in Jumbo Braille (meaning the dots are spaced a little farther apart than standard Braille); they're easier for both blind and sighted people just learning Braille to decipher. In short; hand anybody a Braille Alphabet Tray along with a slate and stylus; and they'll have everything they need to write quick Braille notes. If you have any questions about this product by The Braille Superstore, contact us by completing and submitting the form below. If you are looking for a specif part number, please include it with your message.